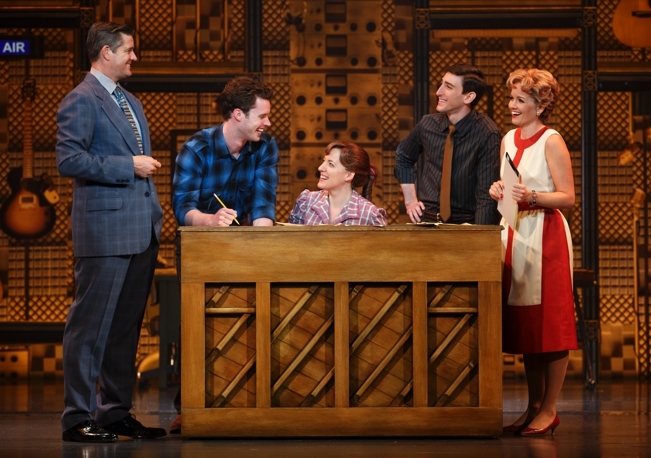 The national tour of Beautiful: The Carole King Musical now plays in a powerful and uplifting production at the Orpheum Theatre. Abby Meuller is glorious in the title role as she goes from teenage dreamer to become a legendary song-maker who reflected the very spirit of changing times. Though the story is formulaic, Beautiful is not merely a chronicle with favorite tunes. Its epic music arc starts in the early ’60s before the stamp of The Beatles and Dylan imprinted the decade for better or for worse. The musical journeys from the years when tunes like “Be-Bop-A-Lula” and “Take Good Care of My Baby” ruled the airwaves to the the time of when “Pleasant Valley Sunday” and “We Gotta Get Out of This Place” reflected the nation’s socio-political upheaval, and on to King’s Tapestry album which became a phenomenon that reflected the forlorn sense of loss that haunted the 1970s. It was also celebration of being a woman. Douglas McGrath’s book is an unabashedly romantic look into King’s love for former husband Gerry Goffin, as well as the couple’s best friends, song-makers Barry Mann and Cynthia Weil. Even if you think that the idea of “true love” is bunk, director Marc Bruni has us root for these two couples to work things out. Beautiful may be more romantic than any musical of recent years, including Once. Liam Tobin is dynamic as Goffin, a man with an undisciplined libido and an obsession for icon status. Tobin reveals the man’s wounded nature with sensitive insight. We don’t approve of him, perhaps, but we understand the hand he was dealt. He and Mueller are one of the most compelling romantic stage duos I’ve seen in recent years. Moreover, you feel the intimacy even in a huge theater like the Orpheum. That said, Mann and Weill are terrifically played by Ben Fankhauser and Becky Gulsvig. Theirs is a relationship that see-saws between to-marry or not-to-marry. Both are plagued by doubts of “what if things go wrong?” Yet it is evident to the audience that the two are soulmates. 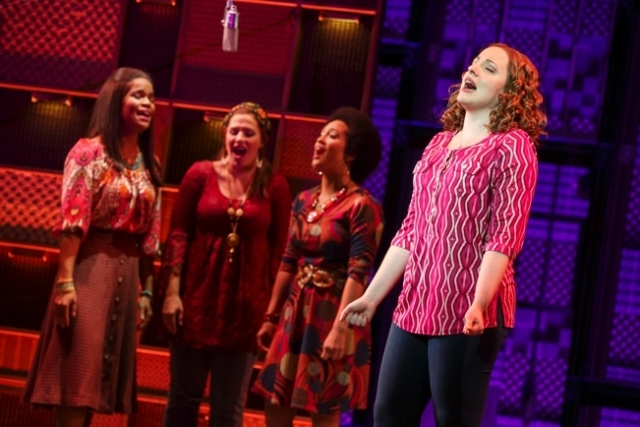 Suzanne Grodner is delightfully cantankerous as Carole’s mother, Genie. This was a woman who would not allow her daughter to play victim when the chips were down. Curt Bouril is majestic as Don Kirshner, the man who brought King into the music business and helped nurture her career. 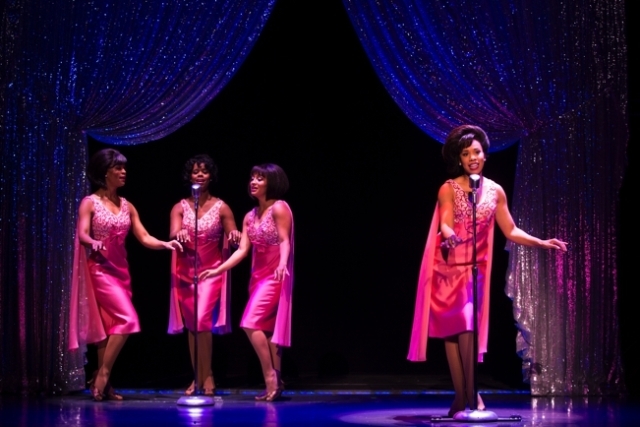 The actresses playing The Shirelles seem to have that classic African American group’s DNA running through them collectively. The marvelous Ashley Blanchet, Britney Coleman, Salisha Thomas, and Rebecca E. Covington as a glamorous Janelle Woods are uncanny. As the all-male African American group, The Drifters, Josh A. Dawson, Paris Nix, Noah J. Ricketts, and Dashaun Young are wonderful. Andrew Brewer and John Michael Dias are dreamy as the Righteous Brothers and Ashley Blanchet charms as “The Locomotion” singer, Little Eva. Josh Prince’s choreography enhances the music numbers to period perfection.